Seventy years ago sometime prior to December 10, 1944, the detached unit of Company C, 3110th Signal Service Battalion left Cherbourg for Paris and rejoined the rest of the battalion. The only photo of Felix A. Cizewski in Paris. 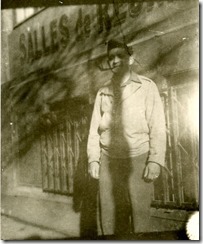 He is standing in front of a building below a Salle de Réunion sign (meeting rooms for rent) with security gates over its windows. Date and unit are unknown. 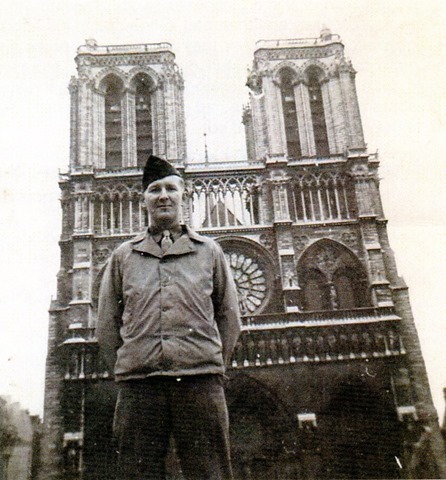 Felix was in Paris in the late fall of 1944 with the 3110th and in March, 1945 while on leave from the 45th Signal Company. Corporal Ray Davidson of Company A reports that the 3110th worked from a building near the Avenue des Champs-Élysées. They were first housed in a hotel near the Avenue des Champs-Élysées. Their hotel had electricity only a few minutes per day and no hot water. Seventy years later. 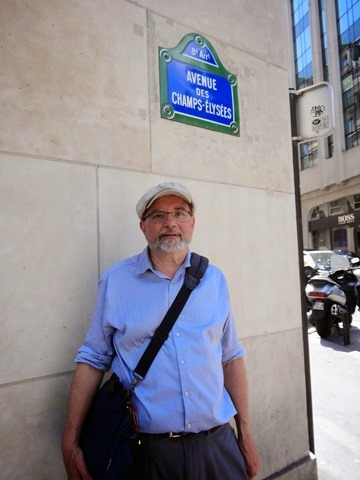 Felix’s son Leonard on the Avenue des Champs-Élysées near where Felix served. Since the exact building that the 3110th used may are not known, I decided that the best I could do was to stand under a sign on the Avenue. Later the 3110th moved to a school near a race track. Hotels near the Avenue des Champs-Élysées were needed for combat troops on leave. Corporal Davidson reported that the public transportation system was not working and bicycles were the main means of transportation. Sidewalks cafes were open but not night clubs or movies theatres. A couple of theatres were showing news reels. He reports that after they first arrived they had to wait in long lines for their meals and the meals were initially “skimpy”. Their meals improved when the battalion was assigned a restaurant with French cooks. The the only documented photo of the 3110th in Paris. Corporal Ray Davidson of Company A in Paris. The WWII Letters of Ray Davidson were compiled by his nephew Charles N. Davidson. Charles privately published them for his family and families of the 3110th. Another post in an ongoing series about our trip to France for the the memorial in Tamerville, part of the observance of the 70th anniversary of the Liberation of France. My late father Felix A. Cizewski served in Company C, 3110th Signal Service Battalion in Tamerville, Cherbourg, Paris providing communications and logistical support for the liberation of Normandy in 1944. This entry was posted on December 3, 2014 at 5:02 pm and is filed under 3110th Signal Service Battalion, Cizewski Lovetere Family History, Company C, U.S. Army Signal Corps in WWII, WWII. You can follow any responses to this entry through the RSS 2.0 feed. You can leave a response, or trackback from your own site.